In 2016, Kevin Ledo was thrilled to collaborate with the Pangea Seed Foundation for the very first international fresh water edition of "Sea Walls: Artists for Oceans" in Toronto, called a 'Love Letter to the Great Lakes'. Together, these efforts brought a much needed voice to the Great Lakes and the many environmental issues that threaten their health. The inaugural Love Letter to the Great Lakes was a dynamic presentation of art and activism in the form of 23 legacy mural artworks in June 2016. 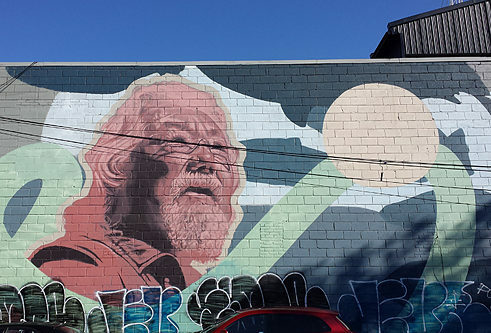 His mural of David Suzuki with Atlantic Salmon swimming in the background focuses on sustainability issues in Canada and their global effects. Atlantic salmon were once present in Lake Ontario and have been classified as extinct there at the turn of last century, as a direct result of human activity. Still today there are numerous species of plants and animals that are at risk of disappearing. Kevin Ledo’s artistic practice crosses back and forth through the boundaries of mural/street art, fine art, and gold leaf art installations. Ledo creates visually bold, iconic compositions, focusing on portraiture and the human form, interlaced with stylized abstract forms. Ledo’s figures are suspended in a minimalistic and slightly surreal world, captured in moments of contemplation, intimacy, emotion and wonderment.